The CT12 Hand Slider Control transfers acceleration and brake from the pedals to the wheel, and makes them manual. It can be installed in cars with automatic transmission and power-assisted steering. It enables people with partial or complete lack of functionality to lower limbs and possibly to one or both upper limbs to drive safely. CT12 consists of a brake lever with a horizontal push and a slider. 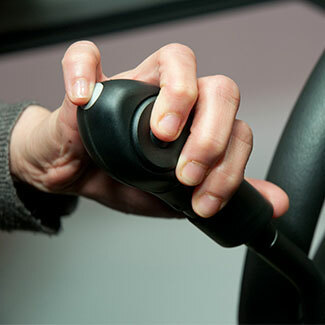 By pushing the lever to the dashboard you brake, while by moving the slider outwards with the thumb you accelerate. CT12 is fitted to the steering column on the right or left, depending on the driver’s needs. Fitting does not affect the airbag opening, does not prevent access to the driving controls and does not limit nominated drivers to use the original car controls.